The stupid coach decided keep their best player, Angel Dimaria on bench and the most experienced midfielder in their midfield, Thiago Motta also didn't play. Thiago Motta as an Italian player who has a lot experience in stopping and delaying matches would have stopped the match, he would have done something different, because he is experience enough to understand such game. 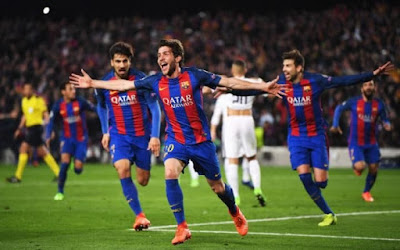 The biggest mistake they made was defending from the start, they would have attacked and also allow Barca to attack, because Barca has one of the worse defense in Laliga, and it would have given them a edge to get more goals as Barca is also getting goals. Two goals would have been more than enough for them to get through. You don't play defensive game against Barca, because Barcelona will surely get goals no matter the situation. But attacking Barca always put Barcelona in dangerous and bad position. At least you get goals against them if you attack them. That was the tactic I expected PSG to use. Barcelona could cancel 10 goals so far they still have those deadly guys at the front of the net.. I mean Suarez, Messi, Neymar, Iniesta. Written by Olusola Olaniyi's Planet Blog-Mariupol State University, Ukraine. Ваш браузер не поддерживает iframe.